Today's caption of the Frontpage Africa is nothing but what I term as 'social undermining', a situation in which "an expression of negative emotions directed towards a particular person or negative evaluations of the person as a way to prevent the person from achieving his or her goals." This is a psychological behavior that can often be attributed to certain feelings, such as dislike or anger. It is not only unique to reporters of the Front-page Africa newspaper but to many other papers and has even taken roots on social media. For most, it has always been about public opinion as opposed to legality. "They say...they say...they say! Never about facts in Liberia." They negatively evaluate Cllr Gibson on things that may involve his actions, efforts and characteristics. For them: "If it looks like a duck, swims like a duck, and quacks like a duck, then it probably is a duck." Do you remember current US Supreme Judge, Clarence Thomas - the African American guy - nominated by George H. W. Bush; of course he was never without controversy. Confirmed by a senate vote of 52 to 48, Thomas had a serious monkey wrench. His confirmation was going smoothly when it was revealed by a local daily that Anita Hill, one of Clarence Thomas’s former co-workers, accused him of sexual harassment. Though there was a heavy public outcry but Bush Sr kept his nominee and he later got confirmed. From Judge Sotomayor, to many other Supreme Court judges nominated by former US Presidents most were marred by accusations and controversies. President Weah must continue to insist on Cllr. Gibson taking on the role as Attorney General though he's expected to face criticism from some quarters. The President must allow the system to work like he did during the runoff. 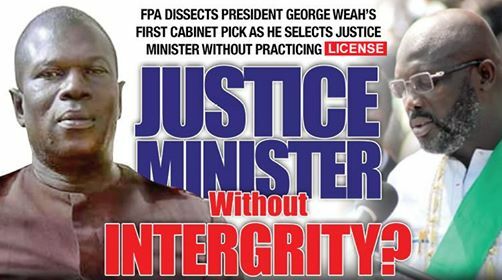 If the same Supreme Court that suspended the Minister designate license to practice law in February, 2017 for allegedly duping his client is now restoring his license; I see no reason whatsoever that this great man should be stopped from serving his country. Some of us in the media who are bent on disparaging others must refrain from this habit as it hurts the Liberian mainstream media. It’s best to nip this undermining behavior - that we take to our workplace - in the bud before it reaches a boiling point. In Cllr Gibson's case: "That was an honest mistake; there was no motive." Yes, we all put our foot in our mouths occasionally. So, "Cut Cllr Gibson Some Slack Folks!"